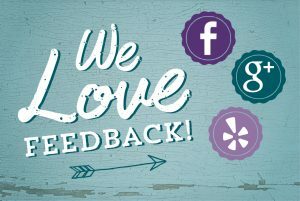 The team at Birth, Stewart, Fletcher Orthodontics truly values the feedback we receive from our patients. If you have ever been into one of our offices, we want to hear from you. We love feedback! You can choose to review us on Google+, Yelp, or Facebook!